Besides exploring the many charming towns around the lake we have listed a variety of natural things to do in Lake Como, Italy. There are plenty of opportunities for fun and adventure, sightseeing and exploring…and the lake is a true paradise for sports enthusiasts. The lake turns into sports city as soon as the weather turns warm! 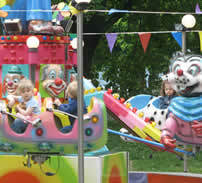 And of course we haven’t forgotten your kids…there are special places by the lake just for them! This magnificent Italian lake has great adventurous natural trails that lead to beautiful destinations in the mountains and by the lake. Follow the trails by the lakesides in each town and discover hidden pebbled-beaches with clear blue waters. Most hotels have bike rentals, inquire within. Although many Lake Como hotels will rent you a bike, you can also rent mountain bikes from various shops in the north such as the Windsurfing Center in Domaso where the space to actually ride is more plentiful. Rates range from 10 – 30 EUR per hour depending on your choice of bike. Note: We highly don’t recommend biking on the main roads or through tunnels as they are too narrow and very dangerous. Boat rentals are a fun way to explore Lake Como’s villas and churches which would otherwise be impossible to see from the road. You can rent a 40 HP boat without a license and expect to pay at least 75 Euros an hour. Gas is included in the price. 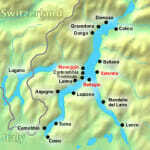 There are boat rental companies in Cernobbio in the south, and in Dongo, Domaso, Gera Lario, and Sorico in the north. There is no motorboat rental company in Como, Italy. There are also private companies in Bellagio and Menaggio which do boat tours on the lake. They start at around 60 euros per hour which can be quite cost-effective if you are traveling with a group. Canoes are much cheaper starting at 19 EUR per hour for a single. From the lake, they can show you up close the many interesting villas such as Villa Balbianello, Villa Erba and Villa D’Este as well as private villas owned by the Versace family or the Villa Rosa which once hosted Sir W. Churchill. Como Lake Boats and Blue easy rent in Domaso. Rent a Boat Newton in Dongo. Boat Rental offers 40hp boats in Menaggio. Cantiere A. Mostes and Matteri in Lezzeno near Bellagio. Lake Como has become renowned for its cooking school for professionals and amateurs alike. For a fun couples activity, why not try a lunchtime cooking course offered by Ristorante Il Caminetto? With so much water, the lake has wonderful places to fish. The main fishing season occurs in the late summer as fish spawn between the end of July and beginning of September. 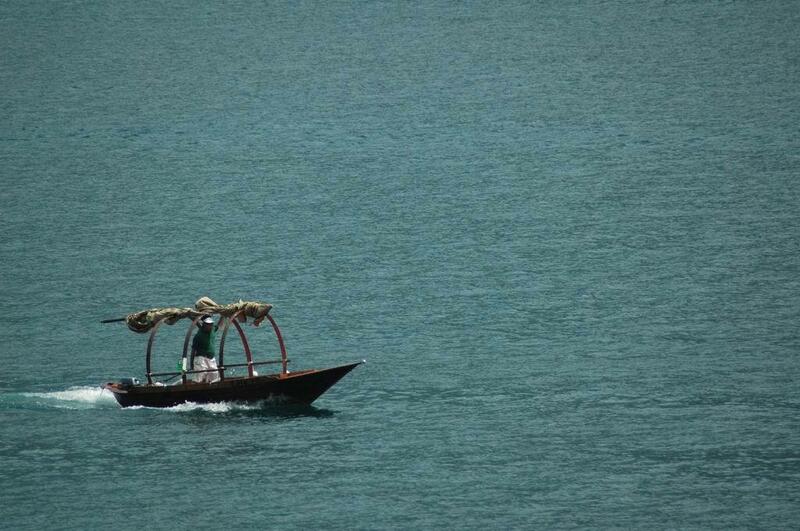 This is the time when you will see many of the famous Lucia fishing boats out on the lake. You need to get a fishing license from one of the local provincial offices. It will cost about 20 Euros. Lake Como has many golf courses which can be easily reached by car the closest being an 18 hole, par 70 course in Menaggio (0344/32103). 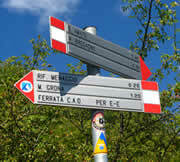 Most of the other golf courses will require a 10km – 20km drive from Como, Italy. Here is a list of golf courses located nearby Como, beginning with the name of the town, type of course and phone number. You can use our interactive map to get driving directions. The Villa D’Este golf course in Montorfano is considered one of the most challenging and difficult par 69’s in Europe, even though several amateur competitions take place there each year. The club house overlooks several holes and offers a spacious view of the Montorfano lake. The Menaggio and Cadenabbia golf course, located about 5km up the mountain from Menaggio in Grandola ed Uniti, is one of Europe’s oldest golf courses retaining its English old-world charm to this day. It was founded by four British gentleman who came up with the idea during a meeting at Hotel Victoria in 1907. Most golf courses are open year-round but be sure to check their schedule as they may be closed on odd days of the week. There are three places which offer horseback riding for the equestrian enthusiasts. One is in the mountains nearby Bellagio (about 7.5 km away) run by the Cavalcalario Club, the other two are North of Colico in the beautiful nature reserve of Pian di Spagna which separates this Italy lake from the small northern Lake of Mezzola. See El Picadero and Centro Ippico for more information. They have qualified trainers who can help out beginners as well as provide interesting, guided tours of the area. You can usually rent out a horse by the hour or for the day. There are ample opportunities for hiking in Lake Como ranging from simple, peaceful lakeside strolls to steep mountain paths offering amazing panoramic views of the lake. The most popular mountain hike leads up to Monte Grona nearby Menaggio, where you can drive up to Breglia (6km from Menaggio – follow the signs toward Lugano, Switzerland) and then hike up to the peak located at 1736 meters. There are also rock-climbing opportunities there. There are two cable-cars in the region, one in Como taking you to Brunate (altitude: 700 meters) and one in Argegno taking you up to Pigra (altitude: 881 meters). Some of the more challenging hikes include the Grigne mountains around Lecco, with paths beginning in Mandello del Lario and Lecco reaching altitudes of over 2400 meters and the Legnone mountains around Colico which reach 2600 meters. There are also trails with special exercise equipment scattered throughout such as the "Percorso della Salute" located 1 km up the mountain from Menaggio. For kids, Jungle Raider Park is a fun adventure park for kids and adults offering obstacle courses amidst in Piano Rancio near Civenna about 12 km up the mountain from Bellagio. Those who like extreme sports will enjoy jumping off of Mount Nuvolone (600 meter drop) on a two-seat para glide. Inquire from within Bellagio, as the company provides a shuttle service from Bellagio to Mount Nuvolone or view their website at the Cavalcalario Club. Another place a little more north near Bellano is Free Air Adventure. The biggest and best playground for children is located in Mandello del Lario which is about 10 km north of Como in an area called Lido. It has a coast guard, a classic horse carousel, and a big playground within a charming park…all designed with children in mind. It can get quite crowded on weekends. Lake Como is a sailor’s paradise. 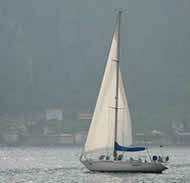 The Tivano and Breva winds which blow from the South create ideal conditions for sailing. You can rent sailboats in Como (sailingdays.it), Lecco and Menaggio costing you around four hundred euros per day included an English speaking skipper, allowing you to take on 4-6 people depending on the boats available. You can also get sailing instructions by enrolling in one of the courses offered at Casa del Lago (Dongo, +39/0344/81631), the Katsegeln Center in Domaso, Circolo Canottieri Domaso (Domaso, +39/0344/97462) and Tabo Surf Center (Gera Lario, +39/0344/94062). Private lessons start at 50 EUR an hour including the cost of the kit and the rate goes down quite a bit if you prepay an entire course. 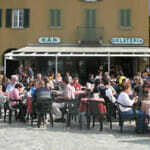 Check out our favorite towns page for detailed guides to each town on Lake of Como. Villa Carlotta in Tremezzo, stunning botanical garden. Villa D’Este in Cernobbio, 5-star grand hotel best seen from the lake. Villa Balbianello in Lenno, home of the famous Arctic explorer, Monzino. Villa Manzoni in Lecco, the birthplace of 19th-century Italian novelist and local hero, Alessandro Manzoni. Castle of Vezio in Varenna, the 7th century Queen Theolinda (queen of Lombard) stayed here. Shopping in Lake Como offers you just about anything you could possibly wish for. Shops and boutiques by the lakeside have as much character and elegance as the individual towns themselves. Whether you are looking for shoes, leather, wallets, handbags, artwork, unique gifts and local crafts you are sure to find it. With Milan so close-by, you are also sure to find designer-line clothing such as Gucci, Versace, Armani and Prada. Although the top shopping centers focus around Como, Bellagio, Menaggio and Varenna, many times the local churches will host the exhibition of a local artist. We found an amazing watercolor painter in a small church in Lenno, who gave us a great discount! Many towns also host a street market on certain days of the week, where you can buy merchandise at discounted rates. They make their presence very well known – you can’t miss them! Why not hire a guide to take you around the lake to explore some its historical gems and best scenic viewpoints? Often this can be booked directly with your hotel, or your hotel can direct you to private companies which offer them. Often these companies can pick you up from the hotel or even the airport, and guide you all around the lake, complete with walking tours through the town centers, ferry boat rides, delicious meals and even evening entertainment. Swimming is best done in the northern towns like Domaso and Gravedona where there are more beaches available and more space available for people to go on those beaches! It also has the cleanest water because it is close to the Adda River which fills up the lake. Unfortunately, due to neglect and heavy industry, the southern towns are not suitable for swimming due to water pollution. Filters are continuously being installed and thanks to new EU laws regarding water pollution, Italy is slowly cleaning up this problem. Remember, the water in the lake drains from North to South since the Adda river is located in the north. The northern towns have swarms of people bathing in the summer, as it allows people to cool off from the hot temperatures, and the beautiful surroundings can make you feel like you are somewhere in the Caribbean! Of course, you can always stay at one of the Lake Como luxury hotels which have the unique, outdoor, floating swimming pools, or try any of the other hotels or public grounds that have indoor/outdoor pools such as the "Giordano" in Menaggio. If all you’re after is the ‘beach-bum lifestyle’, there are plenty of pebble-stoned beaches scattered throughout the lake that will allow you to sit by the water and listen to the relaxing sound of crashing waves. The best ones are at Punta Spartivento (the very edge of the promontory at Bellagio), at Villa Olmo near Como, in Bellano just north of Varenna and all the other Northern towns such as Gravedona, Domaso and Colico. Domaso on the western shore and Dervio on the eastern shore are the capitals of windsurfing and kitesurfing in Lake Como. 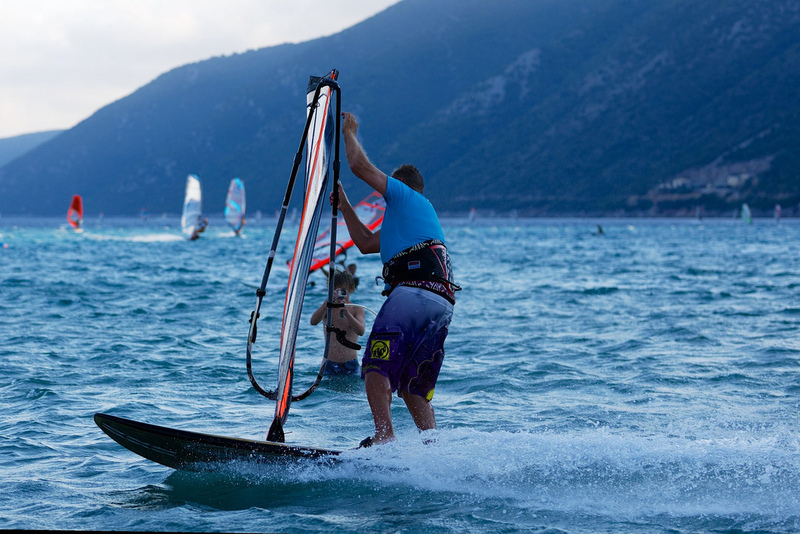 We’ve dedicated another page to windsurfing here. They are both located in the northern part of the lake since the northern part has more space and the best wind conditions. 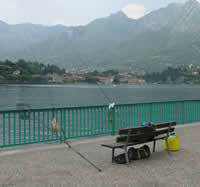 Lake Como also hosts windsurfing championships in this area. The Jolly Racing Club in Lezzeno near Bellagio offers wakeboarding instruction and also rents out jet-skis per minute with a discount for members. With good coaching and favorable conditions, the basic skills of sailing, steering, and turning of windsurfing can be learned within a few hours. 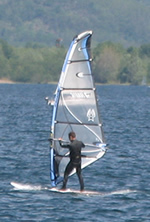 One of the most popular of water-sport activities is windsurfing. 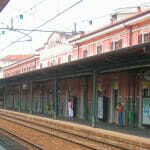 It is primarily done in Domaso, located on the western shores. The winds seem to be most ideal in this northern part of the lake, and you might even catch an international championship taking place, if you’re lucky. Windsurfing isn’t the only activity. There are also clubs which specialize in kitesurfing and wakeboarding, such as the Jolly Racing Club in Lezzeno (close to Bellagio). If you prefer the sound of a motor, they also offer jet-skis with a large discount for members. You are advised to swim only in the northern area of Lake Como, since the southern part is still heavily polluted. It will still take many years to bring the lake up to top EU standards in terms of cleanliness. The Adda river empties into the Northern part of the lake, making it the cleanest part. The best beaches for just laying around, not necessarily swimming, is at Punta Spartivento, Villa Olmo in Cernobbio and in designated areas of Bellano, Gravedona, Domaso and Colico. Another idea for swimming is to get accommodation at one of the five-star hotels which have an outdoor, floating swimming pool such as the Villa D’Este. Lake Como is famous for its Breva and Tivano winds that blow towards the North, making it one of Europe’s hot spots for quality sailing. 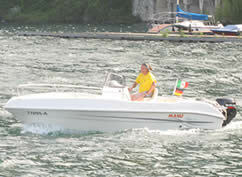 Boats can be rented in Domaso, Lecco, Dongo, Gera Lario and Menaggio costing several hundred euros per day. Each boat can take on an average of four to six people. This includes basic instruction and even a skipper on board. You can even hire a Dehler ’28 with skipper in the town of Como! Visit sailingdays.it for more information. The fishing season takes place from July until September. You need to get a license in order to practice fishing here. This can be acquired at any local tourist office, costing about twenty euros. There are motorboat rentals all around the lake; the most popular companies are in Bellagio, Menaggio, Cernobbio, Dongo, Domaso, Sorico. Paradoxically, the largest town on the lake, Como, does not have a motorboat rental company. 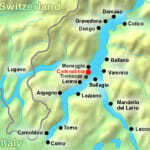 You have to go to Cernobbio! Prepare to pay around 60 euros an hour for a boat rental in Lake Como. There is more to Lake Como than only taking part in water activities. On land, there are just as many fun things to do. One of the most popular of mountain hikes is the Monte Grona close to Menaggio, which reaches a peak of just over 1700 meters. Rock-climbing opportunities also abound in higher peaks such as the ones near Lecco and Colico, also known as the Legnone mountains. The mountains around Lake Como are great hosts for horseback riding lovers. Already about seven kilometres from Bellagio or just north of Colico, there are beautiful nature reserves that have high quality horseback riding clubs. Horses can be rented out by the hour or for an entire day and qualified trainers are always on board. The closest golf course is an 18 hole par 70 course in Menaggio. All other courses around Lake Como require a lengthy drive. It was my first time on Lake Como, and i got a wonderful experience on lake on bord of a wonderful new motorboat (40Hp- no ship’s passport required) that i had rent in Menaggio. Just on the lakeside of, there is a floating dock, there you will find the AC BOAT & KAYAK a new rental company that offers a wonderful “open” motorboat and SIT-ON-TOP KAYAKS. The boat it is furnished with 2 wfide sun decks and permits to see the wonderful villas in Menaggio, Bellagio and Tremezzo. Three hours of cruise it is the best choice, permits you to see Bellagio, Tremezzo, Villa Carlotta, Villa Balbianello and the nice Comacina Island, the only island on Lake Como. The price are very convenient. The petrol station is very close to the floating dock and permits you to do the fuel by yourself before your return (This operation permits you to save money, other rental companies on Lake Como are not so close to the petrol station). For information you can call directly there, Paolo can help and suggest you the best choice for you.